In the era that we currently live in, all the focus has shifted towards data. Each day, the amount of data that is generated and consumed is increasing, adding somewhere around 5 exabytes of data. Everything we do generates data, be it turning on and off the light, or commuting from home to work. This data can be used to generate information that can be used for insights to predict and extract patterns. Data Mining or Data Science is the term that has taken the industry abuzz. It is the process of discovering patterns, insights, and associations from data. In this how-to guide we’ll learn how to use data and implement a predictive model on it to get insights. Our intended audience include developers, general users with basic knowledge of programming, and organizations that want to enhance customer experience. It will enable a user to create a predictive model on Watson Studio, which is a cloud-based environment for Data Scientists. By using this how-to user can predict and optimize their twitter interaction and would lead to optimum traffic on their tweets. 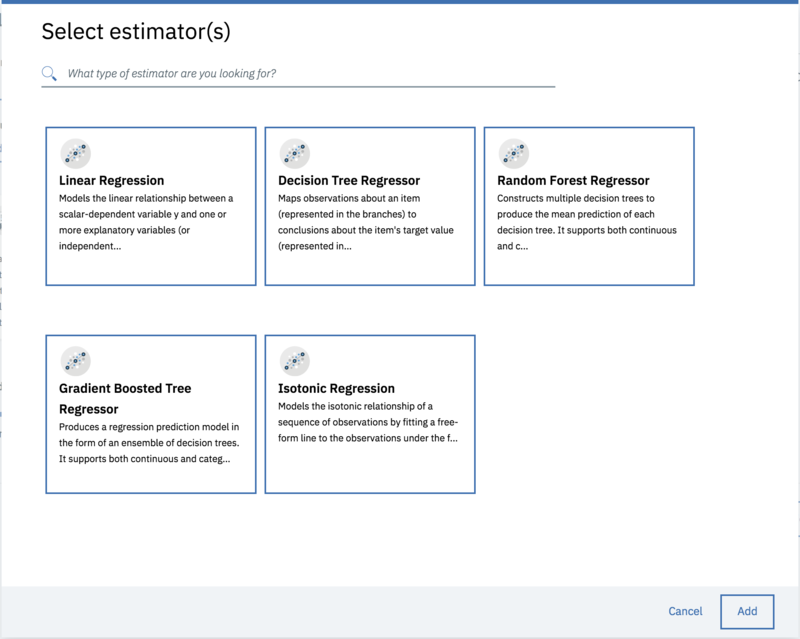 Learn Watson Studio to build a predictive model using any CSV data. 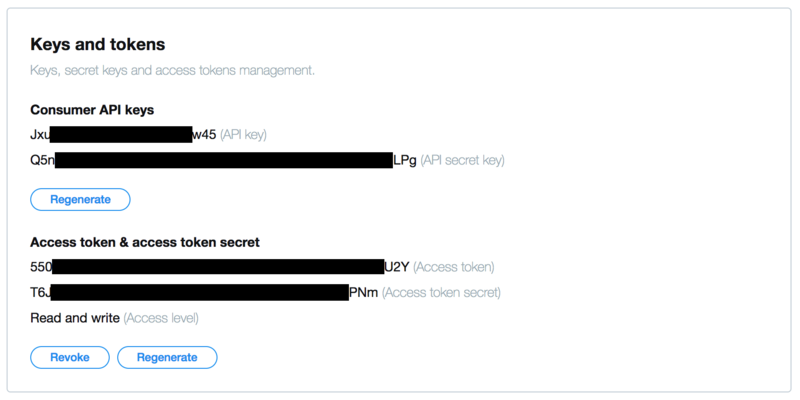 Extract user information from Twitter. Leverage Twitter to predict and optimize their twitter interactions. 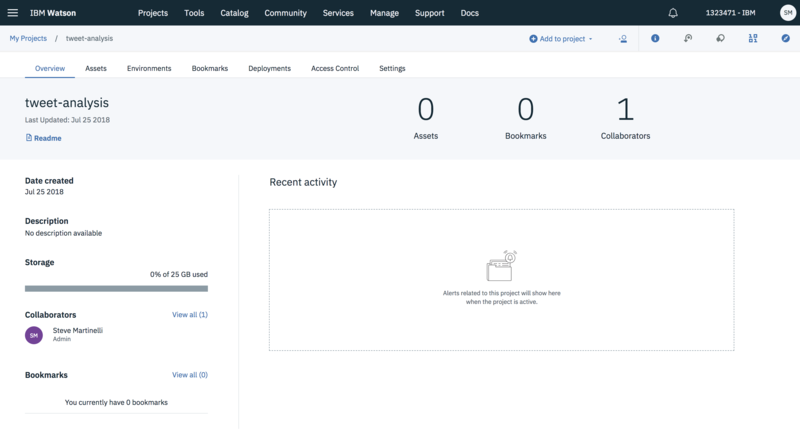 IBM Cloud account – sign up if you don’t have an account yet. To complete this tutorial it should take around 45 minutes. Use sample data or get your own? If you’re using the sample data, then skip to Step 3. These can be revoked and regenerated, but as with any other key, you should keep these secret. Again, if you’re using the sample data, then skip to Step 3. Now that we’ve got our Twitter API keys and secrets, we can use tweepy to save tweets into a CSV file. Free developer accounts on Twitter will limit the amount of tweets that are retrieved, but that’s enough for our purposes. If you don’t have Python, then download and install the latest version, and then install tweepy. This can be done using pip install tweepy, if you have pip installed. Copy the code below into a new file and save it. 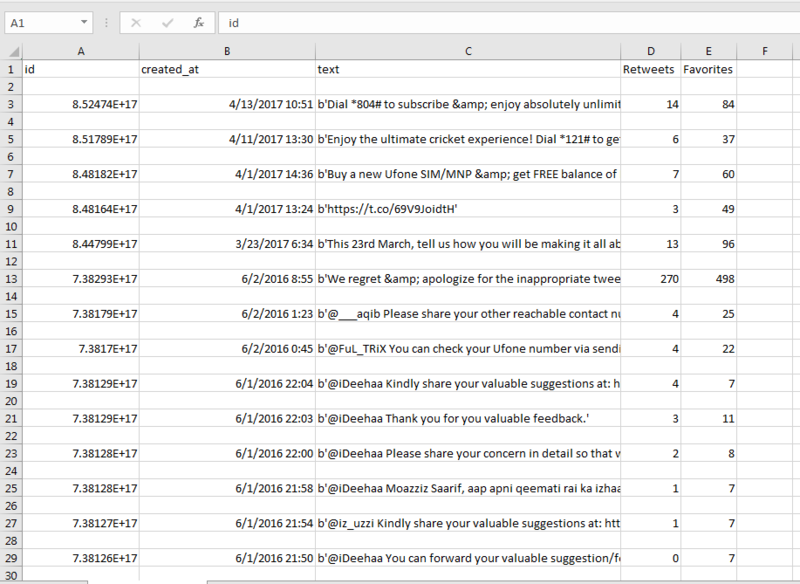 There are a few lines to update at the top, add values to the variables for keys, secrets, and the twitter handle you want to analyze. You can remove the id and created_at columns, and remove empty rows to clean the data a bit. 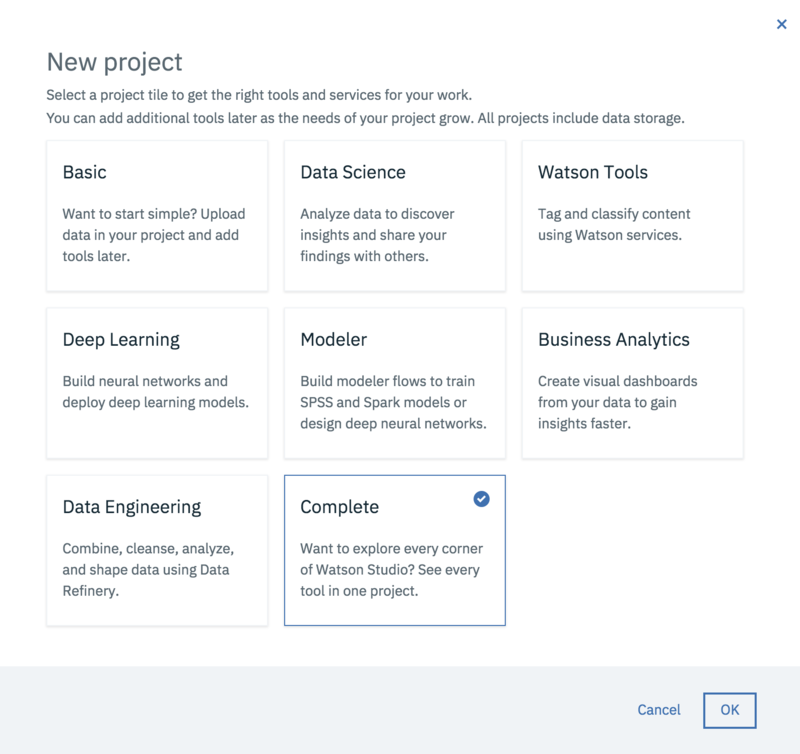 IBM Watson Studio is an easy-to-use, collaborative and cloud based environment for data scientists where they can use tools like Scala, R, Jupyter Notebookc etc. Log into https://dataplatform.cloud.ibm.com/ and choose to create a New Project, the Complete option will work for this tutorial. Once created, we can add an asset, by clicking Add to project and in this case, we’ll click Model, to add a new model. Give your model a Name and Description. We will also set the Model type option to Model builder and choose the Manual for this exercise. Before proceeding we need to associate two services. An Apache Spark service, and a Machine Learning service. You can use the UI to create a new one or select an existing one. For an example of how to do that with Apache Spark, refer to this IBM Code Tutorial. To do that with Machine Learning is the same exercise. Click on the Next button to continue. Loading the data may take a few minutes. 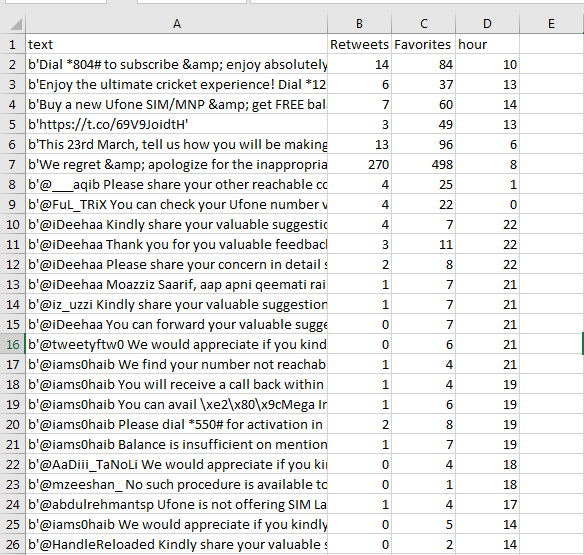 For this example we’re trying to predict the best time to send a tweet, so let’s set the Column value to predict to be hour. Leave the Feature columns unchanged and set to All. The important choice here is the technique used, we’ll be using the Regression technique. We’ll also be leving the Validation Split unchanged. 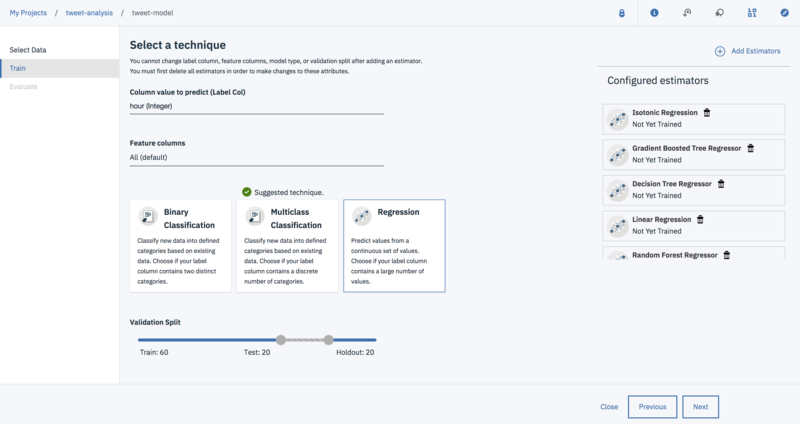 It should be noted that because the classifier is set to hour, which has around 20 values, Watson Studio will suggested Multiclass classification. But in this case the best technique according to our data is Regression. We also need to add estimators. To do that, click on Add Estimators and select all avilable choices, then click Add. Once we have our technique and estimators selected we can click Next. This will start training and testing data. This step will take a few minutes to fully complete. 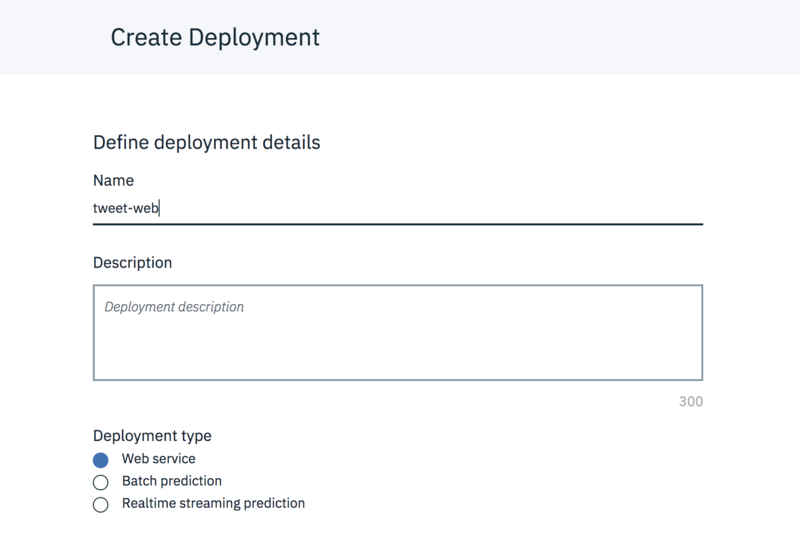 From here, we can create a web deployment so our model is accessible over a REST call. In this tutorial we learned to extract user data from twitter and then perform data science predictive model on it to optimize future tweeting and increasing the users audience. This tutorial of building a model on Watson Studio can be applied on any other CSV file as well and can be further deployed on a web application. 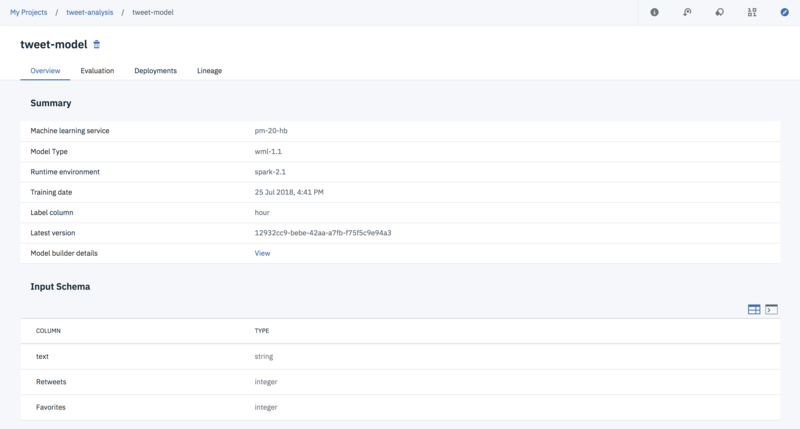 We also learned how to deploy the model as a web application to allow REST calls.